Fox News’ graphics department has made some stunning mistakes this week but this one takes the cake! On yesterday’s America Live, a chart that purported to be a graphic of the 2012 Republican presidential candidates’ standing in Iowa had a photograph of President Obama over the name “Romney.” We’ve reported lately about how Fox has shown favoritism toward the anyone-but-Romney candidate. Is Fox trying to send a subliminal message to its viewers about Romney or just shockingly inept? I report, you decide! Megyn Kelly later apologized for the error. Scott, I disagree completely. They want Romney..perhaps, if this weren’t a mistake, they are subtle enough to use this as a guise, for everything else points to a Romney-Fox alliance with Bill O leading the charge. Reading Fox requires some subtlety at times. this was no mistake, but a deliberate calculated move. They hate Romney THAT much. No, I am not Mace W and don’t know J$ means, and no, I am not fighting you, just offering my opinion, stronger each day, that fox is all in for Romney. They are, in their own right wing way, pragmatic. And Newt leaves a bad taste, it seems, in everybody’s mouth. Fox News has been dividing the Tea Party vote with stunts like their pressuring of Rand Paul to give a Gingrich endorsement. The Tea Partiers who don’t like Newt are seeing that as the network trying to bully their decision. Romney actually does seem to have a lot of Tea Party support- quite a few of the Party heroes endorse him- Christine O’Donnell, Glenn Beck, Nikki Hayley and Tom Thomson for starters. Fox Radio seems to like him over Gingrich as well. I noticed that among the Fox Nation mainstays, the ones that claim to be Tea Party are in a civil war of sorts over Gingirch v. Romney. I haven’t seen Bachmann come up much outside of stories about her exclusively. 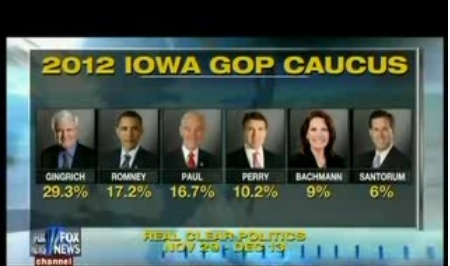 Herman Cain comes up a LOT more, and Ron Paul a fair bit… but not much Bachmann. Now go get informed; I’m not in the mood to fight this with you until doomsday, especially if you’re the Mace W. who used to post on J$. Mace, the Tea Party isn’t as supportive of Newt as some people think. Romney has a pretty big base there, thanks largely to Glenn Beck. Beck’s a Tea Party hero, his word still carries a lot of weight with them. He’s even flaming with Fox News over it- their articles about each other are pretty snipey, and the two sides go at it on the comments. It’d be almost funny if the Teabaggers were saner people. Aria, I am confused by your comments. I don’t think there is a ‘pro-Romney Tea party ." He is probably less popular with them than Gingrich, though Bachman is clearly their love. As for Fox, again, you and I are hearing different things. My sense is that the opinion drivers (Cavuto, Bill O and his tribe —Krauthammer, Powell, Coulter) are in for Romney pretty hard. Now tell me, what voice is pro-Gingrich? I can’t think of one(Hannity is split between the two). Fox Nation as a whole seems fairly proRomany, judging by their pro/anti items count and the the order of names on their poll (Look who is first). And their very sympathetic lead item on his changes of mind. Subtle but it adds up. What happened to the FOX “news” policy of zero tolerance with regards to on-screen errors, hmm? âPlease know that jobs are on the line here,â it says." Well, it coulda been worse . . . they could have put up Osama bin Laden’s picture . . .
Mace, the network is in the tank for Gingrich; in their eyes, he’s the best bet among angenda Republicans. It’s even widening the rift between them and the Tea Party because the Teabaggers are having a civil war over this and the pro-Romney Tea party don’t like Murdoch’s machine butting in. I didn’t know MIttens was a black guy until I saw it on Fux News. Why isn’t the lamestream media reporting on this? The error itself is dime a dozen…. This is the 2nd “error” this week where people speculated an intended message. The first being the graph from monday. Even if you don’t see the inflections, I think the way she worded it is incredibly insulting. Like she honestly thinks everyone watching the segment is stupid enough to need her pointing that out. Of course, these Fox “News” frauds will blame the error on the Fox “News” University interns. The Fox “News” producers and the sad excuse of a production crew in the studio control room couldn’t operate a merry-go-around.